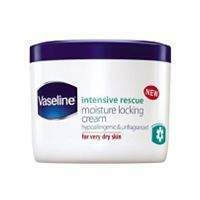 I am a really big fan of Vaseline Intensive Rescue Moisture Locking Lotion and use it every day. I also really like their Relief and Repair Balm. So when I came across the chance to try the cream version for free in exchange for completing a questionnaire about it, I jumped at the chance. Vaseline Intensive Rescue Moisture Locking Cream comes in a tub, unlike the lotion, which comes in a squeezy bottle, and the balm, which comes in a smaller pump-type bottle. Although it's supposedly less hygienic, I actually quite like the tub format. It's quite satisfying to reach in and scoop out a wodge of it, and it can be quicker than pumping or squeezing away - especially when you need to use quite a lot of the product. What is the cream like? Whereas the lotion is very light and liquid, and the balm is a little greasier (in a good way), the Vaseline cream is a really thick white cream - almost like paint! It's so thick that it takes quite a lot of effort to get it rubbed in. This is not good if you have eczema as a lot of a rubbing may irritate your skin more. I found the cream really heavy - I'd say too heavy for a face cream or for hot weather. Being from the same skincare family as the other Vaseline products that I like, I found that my skin did not react badly to the cream - even when I applied it directly on mild patches of eczema, although I did not try it when my skin was at its worst. From experience though, I'd say thick creams are more likely to irritate your eczema than lotion or ointment is. However, if you just have dry skin or very mild eczema you will find that a cream leaves your skin feeling more nourished than a lotion because creams are thicker and more concentrated. Although my skin did not have a bad reaction to the cream, I would not buy it again because it was so thick, heavy and difficult to apply. I'd recommend it perhaps for your hands or dry, scaly legs - or maybe as a night cream rather than as a day cream. I am going to use it all of the tub up, but I much prefer the lotion, which is so quick and easy to apply; you just glide it on and bam! You're done. But I simply don't have time when I'm rushing around in the mornings to get such a thick cream rubbed in all over. My guess is that other people feel the same as I do about it, and that's why they commissioned the market research on it.